If there's one piece of advice I would give someone looking to land a job in fashion, it would be this: Don't let your geographic location hold you back from pursuing your dream job. Beyond that, there are a few essentials you should know to kick-start your career in the fashion industry. Even if you aren't banking on a job within fashion, there are tried-and-true tips that will take you far regardless of the field you decide to pursue. I've gathered up ten of the most valuable lessons I've learned after going after my own dream job. Learn how to network and jump-start a career in fashion all the way from Kansas (or wherever you may be). If your first day is right around the corner, shop some of our favorite picks to build your work wardrobe. It's okay to not know exactly which part of the fashion industry you would like to pursue right out of college, but it is important to educate yourself on the diverse opportunities and aspects within the field. For example, when I was a second semester senior in college, I spent 20–30 minutes every morning researching different publications, brands, and PR firms, trying to figure out what route made the most sense for me. The more you research, the more opportunities you will find. While there are interesting fashion-focused companies in lots of different places, you'll find the most opportunities in New York and Los Angeles. You don't have to pick a coast right away, but doing so is a great way to weed out some of your options and really zone in on what is available and achievable for you. I reached out to both coasts and happened to receive more responses from the Los Angeles area, so that's how I made my location decision. Once you've researched the different types of jobs within the fashion world, make a list of your favorite companies. Don't be shy—include every company you would like to work for. If you are serious about a specific company, think about where you'd fit in and how you could make a great addition to the team. Investigate! Based on your target list, search all social media platforms to learn more about the companies—and the people who work there—that inspire you. If you really understand their sensibilities and preferences, you'll have an easier time gauging if it's the right environment for you and if you're a match for them. For the companies I was interested in, I searched their Twitter and Instagram accounts. I paid attention to the companies they followed, too. This always led me to a new PR firm or brand to research. It also gave me behind-the-scenes insight so I could visualize what it would be like to work at the company. Odds are you won't land your dream job right out of college, so keep an open mind and always produce your best work with a positive attitude (no matter the task). You never know, a job you "settle" for might turn into something amazing, or lead you to another, even better position. You will probably have to start your career as an intern: accept and embrace this. But it's actually a good thing! By interning, you'll gain valuable experience in the field and build numerous contacts through your bosses and fellow interns. You'll also have firsthand experience with that company's culture, so you can decide if it's a good fit before having the commitment of an actual job offer. Once you do land an internship or job, make yourself valuable. Prove your worth through your work, not your words. The best ways to get noticed in a company is by producing quality work, being reliable, and having a positive, can-do attitude. After an internship, it's crucial to maintain relevant within the industry by keeping in touch with old bosses, sending follow-up and thank you emails, and staying up-to-date with fellow interns. Bottom line: Use your contacts to your advantage. Sometimes you just have to go for it! If you're passionate enough about the industry, you will find a way to make it work. So go ahead, pack up your car and make the move! 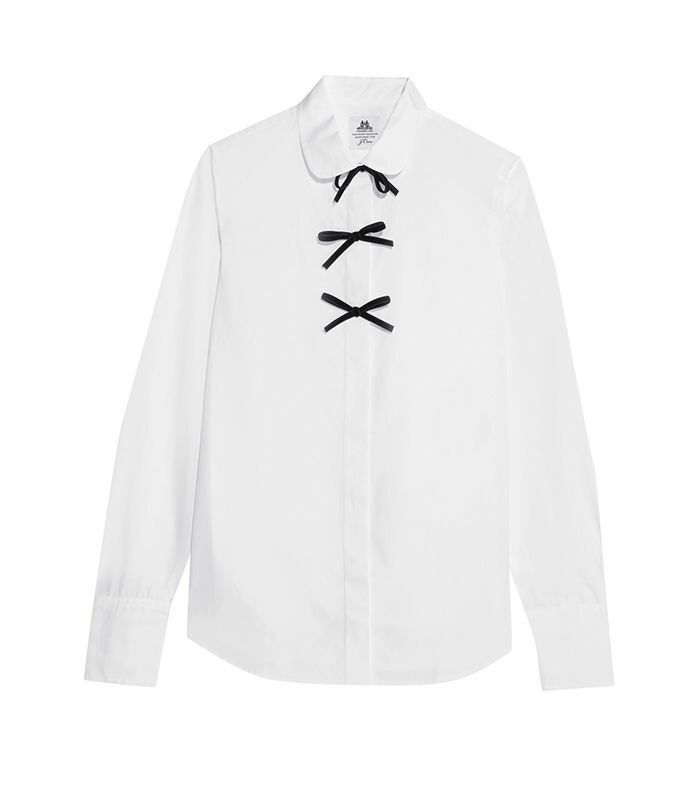 Bow embellishments add a dash of whimsy to this standard white button-down. Fashion forward and still work-appropriate. Inject a '70s vibe into your work wardrobe with this wrap skirt. Every work wardrobe needs a sleek loafer. The tie sleeves add a deconstructed edge to this feminine pick. The pencil skirt just got a whole new look. Save off-the-shoulder for after-work hours. Opt for a wide boatneck instead. The beauty of a classic moto jacket is that you can dress it up or down. A clean, sharp design makes this bag so versatile. The LBD just got an office makeover. Pair with loafers for a menswear-inspired style. Break up the usual black work basics with a neutral blush. These are the kind of stylish accessories that make an outfit. Mix navy into your work style to contrast with grays and browns. A tie-front embellishment accentuates the waistline. The perfect black pump instantly adds polish to your outfit. The frilled sleeves steal the spotlight on this dress. Up next, see five easy work outfit formulas that are so simple to throw together.